Up a side track to hospital a few months ago. Back on track now. Usually I avoid personal posts, preferring to obscure personal matters within my drawings. Images are either buried or altered to be unrecognisable in the final image. The collage below is an example of this. This personal matter has a wider context. Growing old is an adventure kept secret from the young. No one tells you how it is. The aging experience is silenced in fear of exposing human frailty or vanity. Soldier on they say and join the ranks of the invisible elderly. That said, the creeping nature of coronary disease needs to be called out. 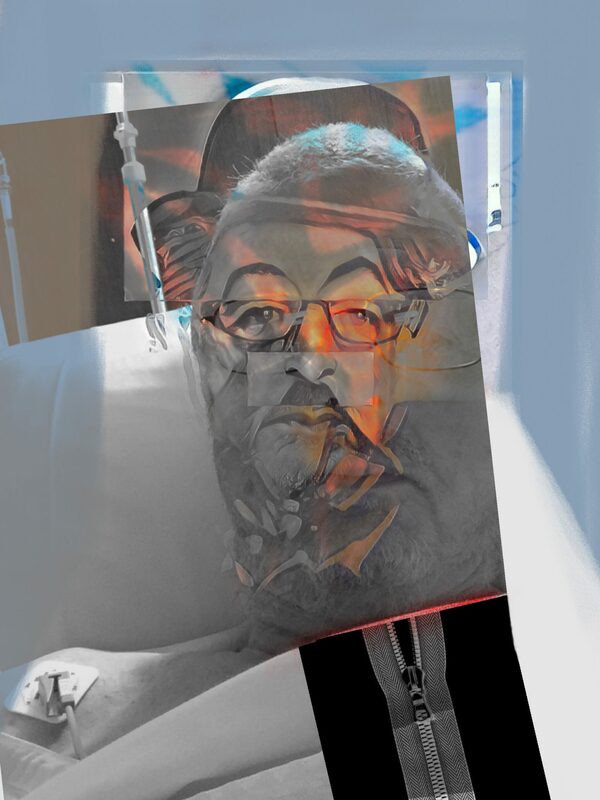 This rather melodramatic self portrait captures the pathos of Charlie Chaplin with glimpses of medical paraphernalia following my cardiac bypass. It is now over 3 months since I joined the zipper club. It was a preemptive operation, rather than my heart throwing a surprise wobbly. Still, it was a shock to the system and the family. As my imagination tends to run wild I was provided with a ” relaxant ” pill in the evening prior to the morning CABG procedure, only to wake up 3 days later in the intensive care unit replumbed. I thank the medical team for their skill and care. Photo and digital collage of my scar taking in the healing sunshine at Lake Mungo. Hospital time passed between injections, blood pressure readings, blood samples with my trusty iPad, making digital collages and discovering mindless Brooklyn Nine-Nine series 1 episodes. Oh yes, my exercise routine tracking around the ward was brightened by stopping at the fish aquarium, an excuse to have a breather. Hospital carpet and a fish drawn for the addafish campaign for Mr Eatenfish and other refugees. It is probably a good idea to disguise the more clinical photo of tubes, stitches and wires within my digital drawings of the event. The aging process is a new adventure. Where to take it?